Bulding a better Burger... Is like building a better franchise. With record of selling 17 million Hamburgers, 11.3 million soda pops, 8.3 million Shakes and Malts, 8 million pounds of Fries, 2.1 million orders of Onion Rings and 815,000 gallons of ice cream each, Johnny Rockets three decade experience in fast food dining. Chef inspired hand-crafted menu cater classic All-American Diner Experience with modern twist. After winning the palates of food lovers across USA, Ship, Australia, Bahrain, Bangladesh, Brazil, Canada, Chile, China, Colombia, Ecuador, Germany, Guyana, Costa Rica, Honduras, Indonesia, Italy, Kuwait, Malaysia, Mexico, Nigeria, North Cyprus, Norway, Panama, Paraguay, Peru, Poland, Qatar, Saudi Arabia, South Korea, Tunisia, UAE, Uruguay, the brand is all set to make its debut entry in India. The company as a place is great for its burgers, fries, ice creams, beverages and remarkable services. 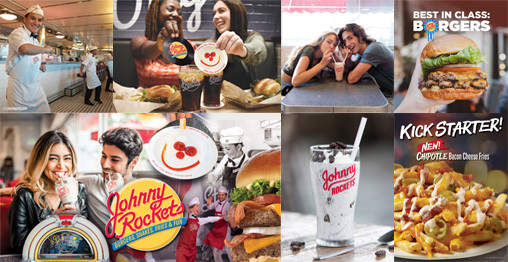 Not confined to any decade or era, Johnny Rockets combines the best elements from a century of American dining history to create an experience and menu that are relevant today.